Rental Command is a powerful administrative portal that manages vacation condos and villa rental bookings. With this custom software, companies can integrate and rental program which will allow managers to view booked properties at a glance, manage a guest database, process bookings and fees, manage owner logins, and so much more. The system can be added to an existing website. Using this custom rental program allows website visitors to browse listings with ease. Guests can find properties they like, contact the renter and/or book the a reservation. Guests can pay for their preferred rental using the integrated booking feature which instantly updates the availability calendar. 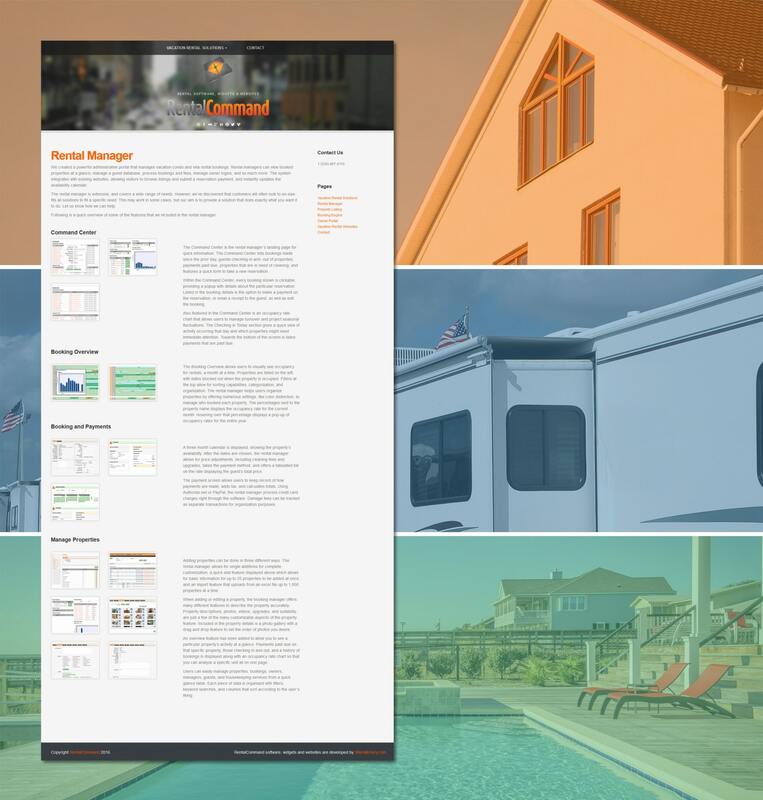 Command Center – The rental manager’s landing page for quick information. Booking Overview – Allows users to visually see occupancy for rentals, a month at a time. Booking & Payments – A three month calendar is displayed, showing the property’s availability. Manage Properties – Users can easily manage properties, bookings, owners, managers, guests, and housekeeping services from a quick glance table. The Rental Command software program we developed is designed for home rentals. Even though primarily used for vacation properties, the software is customizable. Rental Command can be used for RV Rentals which is a growing market, along with car rentals or even equipment rentals. When it comes to rental management software, Rental Command was designed to cover it all. The software offers a wide range of rental options and features, designed to create the ultimate rental experience. With Rental Command, we designed the software to be flexible and customizable. Not all solutions fit every need. For those who need special features created, rest assured. Our design team can develop additional add-ons to support your rental business. If you have an idea, we can bring it to life. The Command Center is a well laid out dashboard filled with quick information about your rentals. In the dashboard, you can setup bookings manually as well as monitor what is currently booked. As a rental manager, you can see if guests have checked-in or have checked out. You can see if payments are past due and even check if your rental properties need cleaning. In the Command Center, you can easily navigate through your bookings. Details about the reservation can be accessed with a simple click. The rental manager can make payments on a reservation, edit any current bookings and email a receipts to the rental guest. There is also an occupancy rate chart that allows the rental manager to manage project seasonal fluctuations and turnover. The Booking Overview displays all rental occupancy within a monthly format. Within the overview, guests can see which properties are occupied by a simple color coded notifier. On the calendar itself, rentals that are occupied will be displayed on the calendar with the dates blocked out. This simple visual feature makes it easy for guests and rental managers to know what dates are open, and what dates aren’t. Depending on the volume of rentals available, the calendar can have a lot going on. To help sort through the bookings, we have included filtering features to narrow down properties. Guests can sort through properties by categorization and organization. As a rental manager, offering numerous settings to filter with will help guests pin-point rentals. For instance, filtering rentals with a color distinction to figure out which property is booked. If a guest likes Property-A and is associated with the color blue, then the calendar will display the dates blocked out in blue. Property-B on the other hand may be associated with green, so the calendar will display green block out dates for Property-B. And, so on..
As a guest, rates for a rental are easy to find. Each rental property name will have a percentage next to it. This is where the occupancy rate can be found for the current month. In the rental market, prices can fluctuate due to seasonality. The rental manager has control over the pricing that best suits their needs. If the guest wants to see the rates for the entire year, they can hover over the current rate displayed. A popup will appear and display the rates for the entire year. When it comes to accepting bookings and payments, a three month calendar is displayed. The calendar will show the property’s availability. After dates are chosen, the booking is submitted and the rental manager evaluates the booking. During this time price adjustments, including cleaning fees and upgrades are applied to the rental booking. Then, the rental manager can take payment and offer a tabulated bill displaying the guest’s total price. The process is designed to offer total control while being flexible to cater the rental experience to meet the needs of the guest. As for the payments themselves. The payment screen allows guests to keep a record of how payments are made, adds tax, and calculates totals. Using the software program, we include a merchant account feature. The rental manager can process credit card charges using PayPal or Authorize.net. No need for a merchant account setup or jumping around to process payments. All can be done righ through the software. By having payments all in one place, fees can be organized to help with reports. An example would be damage fees. These fees can be tracked as separate transactions for organization purposes. Not all rental needs are the same, which is why we add multiple ways to add inventory to your website using our software program. Adding properties can be done in three different ways. The rental manager allows for single additions for complete customization. A quick add feature displayed above which allows for basic information for up to 25 properties to be added at once. An import feature that uploads from an excel file up to 1,000 properties at a time. Whether you are adding or editing a property, the booking manager offers many different features. These features allow the rental manager to describe the property accurately through property descriptions, photos, videos, upgrades, and suitability. A valuable feature is the “easy to use” photo gallery. As a rental manager, upload and rearrange your gallery using a familiar drag-m-drop system. List the photos in the order you want within seconds. This is just one of the many customizable aspects of the property features. For the rental manager, an overview feature is included. This overview allows rental managers to see a particular property’s activity at a glance. Easily discern if payments are past due on a specific property. Check and see if guests have checked in and out. There’s even a history of bookings displayed, along with an occupancy rate chart so that you can analyze a specific unit. All of this on one page, making rental management convenient and informative. When it comes to the rental management software we have developed, the control is in the hands of the user. Rental Managers can easily manage bookings, properties, managers, owners, guests, and housekeeping services from a quick glance table. Each piece of data is organized with filters, keyword searches, and columns that sort according to the user’s liking. This is more than just a piece of a software, it’s revenue generating investment. Talk to us if you are looking for a rental solution, we would love to help. Vacation rentals don’t have to be difficult to manage and operate. Whether you are looking for a friendly portal to display vacation rentals, rent out personal equipment or have an RV lot that you would like to list. We can build it. We’ve design and develop supportive widgets for websites. Add a weather widget to display the current forecast. Add a gallery and slider widget to showcase images, perfect for feature properties. Add an availability calendar to your website and more. We are here for you. A serious website gets serious attention. We have designed websites for years and know what it takes for a website to perform. Our team of designers produce stunning websites that are responsive, information and incredibly fast. Let’s capture visitor attention together. When it comes designing a vacation rental software program. We have spent years researching property management limitations. We look at the setbacks and challenge ourselves to create a solution that will benefit all. We strive to develop and refine each piece of software we design. Evolving with the growing market and expanding upon its demands. Over the years we have produced a solid portfolio of fantastic websites. We have grown and learned many things. In each area, continue to be proactive with our software solutions. If you are looking for industry solutions to your rental property needs – we have the product.